Proper soldering and unsoldering are key skills if you plan to make electronic repairs. Here's how it's done. The process is both easy to learn, and fun. Do remember to work safely. Always use 60/40 rosin core solder. Never use acid core solder. Use a low wattage adjustable 1-50 Watt iron with a small tip designed for printed circuit boards. Use a higher wattage iron or gun for large connections on older "hand-wired" sets. Clean both soldering and desoldering tips with a moist sponge and then tin them by melting a little solder onto the tips. This preserves the tips and makes it easier to transfer heat from the iron or sucker to the PCB. Solder needs to flow between the wire and the printed circuit board copper, so you need to simultaneously heat the wire and the circuit board pad momentarily, (typically three-seconds or less), before applying solder. Too much heat can damage the board and/or the component. Too little heat can cause a faulty, or so-called cold joint. 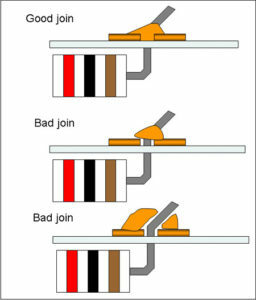 Moving the component before the new joint cools can also cause a cold joint. Good joints look shiny and smooth. Cold joints look dull and rough. When in doubt, reheat. Don’t use too much solder or it might flow over to other traces on the circuit board causing a short circuit. 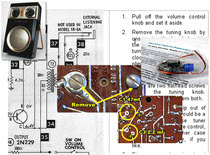 To remove a component you must heat up all the joints connecting it to the board without damaging anything, and then wiggle the part loose. While it is possible to "wick away" molten solder with a copper braid, desoldering is much easier with the proper tool, or better yet, a sucker-equipped soldering or rework station or a solder sucker. Hand-wired parts in older sets require slightly different techniques. If the joint is easy to access and only has one or two other components connected there you can simply heat the joint and unwrap the wire of the defective component, then wrap the new wire back on the connecting point and carefully resolder everything. 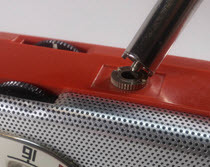 If the joint is hard to reach, or offers other challenges, you might be able to clip the component wire in an accessible area, create a hook on the end of that wire, and mate it with a hook on the new component. Do you have soldering tips and experiences to share? Questions? Suggested corrections or additions? Leave a comment below. I’ll review comments and post or incorporate the most useful ones. Your email address is required if you choose to comment, but it will not be shared.